Listening to Noise and Silence, Salome Vogelin, 2010. In today’s data saturated world, currents of information transfer are routinely harvested, and computational aesthetics has become a fundamental component of design, art and technology. As the pathways of data science and experimental sonic art converge, immersion becomes more important not only as a sonic phenomenon; but a philosophical and imaginative platform for exploring the progressive transition of the spaces we inhabit from acoustic and concrete towards more hybrid, technoscientific and telematic systems. 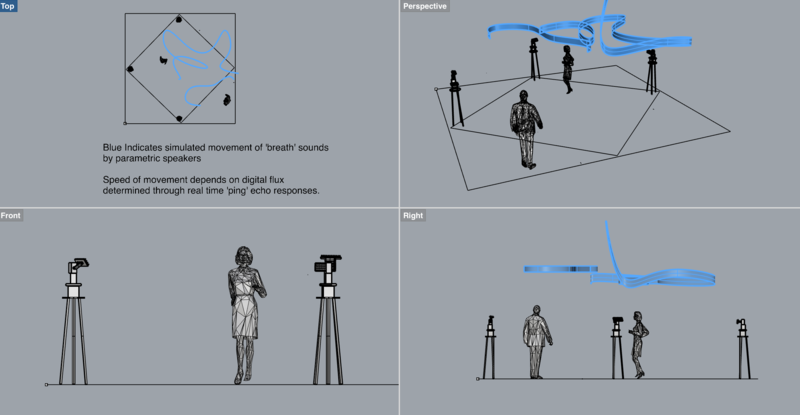 This project presents a possible sonic world based on the flux or “weather” of digital connectivity. It uses the metaphor of breath and especially the way breath connects us (via Ingold) with the wind in the environment to infer a dynamism of the digital, online network, one that can be seen as rhythmic, perennial and quiet. The project’s title also carries dual weights, referring both to the process of respiration and “expiration” that constitutes breathing; but also to mean close to expiry. The latter references the anxiety we might feel in the obsolescence of the body within the digital environment and the way presence and locality has come to be defined less by our physical bodies, but by the devices that we own (e.g. If you do not own a smart phone, you do not exist, or you do not exist anymore). Where the notions of respiration, breath and living rhythms previously referred exclusively to our homeostatic quotients of liveliness and wellbeing, this project explores the ebb and flow of a digital system through the biological framework of breathing to create an interactive system that collects and releases mobile phone data from the visitors. Here, the project focuses the underlying, homeostatic equivalents of digital connectivity. It uses the ping functionality of any given digital device – to send packets from a fixed server and trace the time the packets take to return (echo response, or even echo-location, effectively representing how far away the device is) – to trace who is and where someone is in the digital domain. This data creates a cartography of digital distance through which the system generates 3D abstract patterns to determine the movements of the parametric speakers and their sounding. The use of parametric (hyper-directional) instead of conventional speakers aids the illusionary movement of sound across a wall and onto the bodies of the visitors. In this way, the gallery environment is saturated with sound that moves and changes constantly. Thus, this project proposes that the body is swept up in a technoetic “wind” exposing the locality and functionality of our tethered devices and how these are automatically and irreverently entangled with our experiences of space. This work is part of the artist’s engagements at the intersection of computational simulation of real world elements, and the embodied presence of a visitor within a sounding environment. “Expiration: a Lingering Breath”(2016) is an audio-visual presentation of the real-time, site-specific internet activity triggered by the user’s physical arrival at the gallery, as well as his arrival at a digital destination (an Internet Website hosted by a local server). At the entrance to the piece, the user is instructed to scan a QR code which leads him to a website that collects data about his device. While he is present within the gallery, the system continuously pings’ the device, collecting rates of echo response and aggregating these with the rest of the visitors to the system. This creates an overall ebb and flow, or inpiration and expiration rate that is then sent to the physical systems in the gallery. In the gallery, an array of 3-5 (depending on space allocations) parametric speakers are mounted in the space. 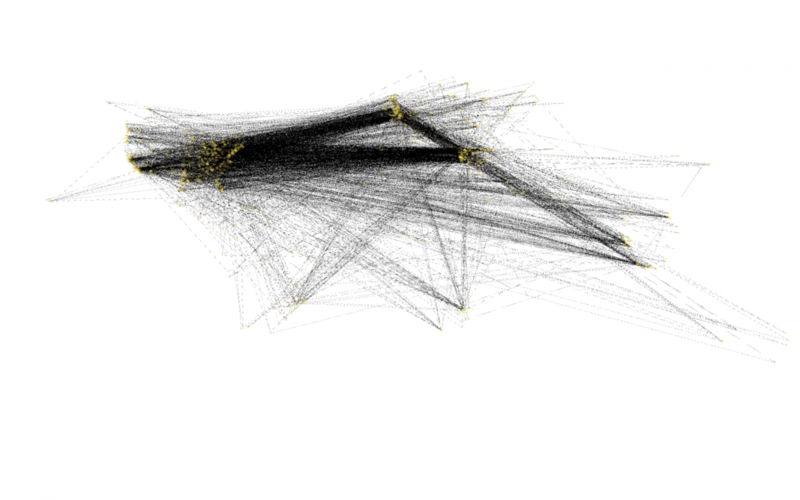 They trace composed geometrical forms (generative based on artist’s spatial compositions), and the rate of their movement and sounding are defined by the digital system’s data input. A screen displays the simulated movement of the parametric speakers as 3-dimensional abstract geometries, and a 4 channel soundscape establishes a techno-scientific atmosphere with a subtle glitched soundscape. Background 4 channel ‘glitched’ digital environment.